More than 5,300 properties, the vast majority of them Greek-owned, were badly damaged or destroyed that night. Among these were houses, businesses, churches, monasteries, schools. The Constantinople-Istanbul pogrom, also known as the Constantinople riots or September events, was organised mob attacks directed primarily at the city’s Greek minority on 6-7 September 1955. The events were triggered by the false news that the Turkish consulate in Thessaloniki – located at the house where Mustafa Kemal Atatürk, the founder of modern day Turkey had been born in 1881 – had been bombed the day before. A bomb planted by a Turkish usher at the consulate, who was later arrested and confessed, incited the events. The build up to the riots, though, goes back to Greece’s appeal in 1954 to the United Nations to demand self-determination for Cyprus. The day before the Tripartite London Conference (29 August – 7 September 1955) on the future of Cyprus began, with the participation of the colonial power Britain, Greece and Turkey, Turkish Prime Minister Adnan Menderes claimed that Greek Cypriots were planning a massacre of Turkish Cypriots. Deflecting domestic attention to Cyprus was politically convenient for the Menderes government, which was suffering from an ailing economy. Although a minority, in a city with a population of over 1.5 million people at the time, the Greeks played a prominent role in Constantinople’s business life, making them a convenient scapegoat during the economic crisis in Turkey in the mid-50s. The London conference fell apart on 6 September, the first day the subject of Cyprus was to be taken up at the conference, when news broke of the bombing of the Turkish consulate in Greece’s second-largest city, Thessaloniki. Prime Minister Adnan Menderes and Foreign Minister Fatin Rustu Zorlu mobilised the formidable machinery of their ruling Demokrat Parti (DP) and party-controlled trade unions of Constantinople that night. According to Zorlu’s lawyer at the Yassiada trial in 1961, a trial staged during a period of a military regime, a regime which overthrew Menderes’ government in May 1960, a mob running in their tens of thousands was marshalled in a radius of 60 km around Constantinople for the attacks. The trial also revealed that the fuse for the consulate bomb was sent from Turkey to Thessaloniki on 3 September. During the Yassiada trial it was claimed a twenty-year-old university student named Oktay Engin was given the mission of installing the explosives, two sticks of gelignite, in the consulate’s garden. The consul M. Ali Balin allegedly first pressured consulate employee Hasan Uçar, but Engin was brought in when Uçar resisted. Both of them were arrested after the attack. In his 2005 book The Mechanisms of Catastrophe: The Turkish Pogrom of September 6-7, 1955, And The Destruction of the Greek Community of Istanbul, renowned Greek American academic Speros Vryonis, amongst others, documented the direct role of the Demokrat Parti organisation and government-controlled trade unions in amassing the rioters that swept Constantinople-Istanbul. However, while the DP took the blame for the actual events, it was later on revealed that the riots were a product of Turkey’s Tactical Mobilisation Group; a clandestine special forces unit. During the night of September 6 to September 7 1955, municipal and government trucks were placed in strategic points all around the city to distribute the tools of destruction (shovels, pickaxes, crowbars, ramrods and petrol), while 4,000 taxis were requisitioned from the Drivers Association and Motor Vehicle Workers’ Trade Union to transport the perpetrators. In addition, flags had been prepared by the Textile Workers’ Union. A protest rally on the night of September 6, organised by the authorities in Istanbul, on the Cyprus issue and the bombing of Atatürk’s home, was the cover for amassing the rioters. At 1.00 pm, news reports of the bombing were announced by radio. However, most people at the time did not have radios, so they had to wait until 4.30 pm, when the daily İstanbul Ekspres, which was associated with the DP and the National Security Service (NSS), repeated the news in print. 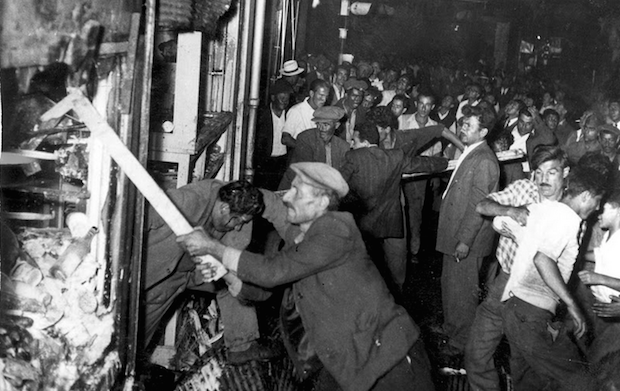 At 5.00 pm, the riots started in Taksim Square, and rippled out during the evening through the old suburb of Beyoğlu (Pera), with smashing and looting of Greek commercial property, particularly along Yüksek Kaldirim street. By six o’clock at night, many of the Greek shops on Istanbul’s main shopping street, İstiklal Avenue, were ransacked. Many commercial streets were littered with merchandise and fittings torn out of Greek-owned businesses. “Onward to Athens and Thessaloniki” as they attacked. Predictably, the situation soon became out of control and the mobs were shouting “First your property. Then your life”. The riot died down by midnight with the intervention of the Turkish Army and declaration of martial law. The police force, which supported the attacks by preparing and organising the operations, was ordered to hold a passive stance and leave the mob to roam the streets of the city freely and commit atrocities against the civilian population. The Turkish militia and police that coordinated the attacks refrained from protecting the lives and properties of the victims. Their function was instead to preserve adjacent Turkish properties. However, there were a few cases where police officers prevented criminal activity. On the other hand, the fire brigade, whenever it reached a fire, claimed that it was unable to deal with it. While the rioters were not instructed to kill their targets, sections of the mob went much further than scaring or intimidating local Greeks. Between 13 and 16 Greeks and one Armenian (including two clerics) died as a result of the pogrom. However, a number of deaths were never recorded due to the general chaos. It is now accepted that the total death toll is estimated to be at least 36. Apart from the thirty identified victims, an additional three unidentified bodies were found inside the shops, while three burned bodies were found in a sack in the region of Besiktas. Moreover, 32 Greeks were severely wounded. Men and women were raped and islamised by force, and according to accounts including those of the Turkish writer Aziz Nesin, men, including a priest, were subjected to forced circumcision by members of the mob. Moreover, an Armenian rite Christian priest died after the procedure. Priests were also scalped and burnt in their beds and Greek women raped. More than 5,300 properties, the vast majority of them Greek-owned, were badly damaged or destroyed that night. Among these were businesses, houses, churches, monasteries and schools. The American consulate estimates that 59 per cent of the businesses were Greek-owned, 17 per cent were Armenian-owned, while 80 per cent of the homes were Greek-owned, 9 per cent were Armenian-owned, and 5 per cent were Muslim-owned. The pogrom greatly accelerated emigration of ethnic Greeks from Turkey, and the Constantinople-Istanbul region in particular. The Greek population of Turkey declined from 119,822 persons in 1927 to about 7,000 in 1978. According to Human Rights Watch, the Greek population in Turkey was estimated at 2,500 in 2006.